In the recent report The Corporate Sector and Children’s Rights in the Nordic Region, Global Child Forum and the Boston Consulting Group published the results from a benchmarking of how the 299 largest1 listed Nordic companies address children’s rights in their public reporting. To compare the findings from the screening of publicly listed companies, we assessed 30 non-listed Nordic companies; the 15 largest privately owned and the 15 largest state-owned. A summary of those results are presented below2. Of a total possible score of 9, the privately owned companies scored on average 2.1 points, while state-owned companies scored 3.7 on average. In contrast, the 15 largest listed companies scored 5.1 on average. One explanation for the difference could be due to the region’s stringent regulations on sustainability, reporting, and board accountability that affect primarily listed and state-owned companies. Due to the small sample size, not all industries are fully represented; approximately half of the private companies are in the Consumer Goods industry, with the remainder spread across Oil, Gas and Utilities, Food and Beverage and Industrials. The state-owned companies assessed are in all of the industries except ICT. The privately owned companies have an opportunity to improve in addressing children’s rights issues other than child labour, such as product responsibility, responsible marketing or sexual exploitation. 2 For more information about the methodology and the indicators used in the screening, please see The Corporate Sector and Children’s Rights in the Nordic Region. 3 Companies that score between 6–9 points are considered high-scorers. Here, only state-owned and privately held companies are shown. For the high-scoring publicly listed companies, please see The Corporate Sector and Children’s Rights in the Nordic Region. 4 The IKEA Group is regstered in the Netherlands. 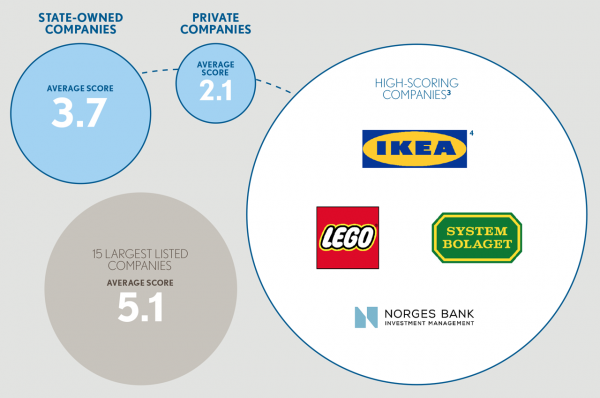 As a consequence, they are not part of the sample of companies included in the total average score of private Nordic companies. However, because of their Nordic origins, their child rights practices have been analysed for the sake of knowledge sharing. Here you can download this report and related resources.